I firmly believe that voice is one of the key tools that a speaker has to play with in order to make an impact. I have always been influenced by the voice and delivery of various speakers but, prior to conducting this study, perhaps not so consciously. Some public speakers would really create an impression and others would quickly become a distant memory. I had never really asked myself why that was and what in particular made one speaker so engaging and another less so. Was it their voice or was it something else? Could it be a combination of things? If a combination, what weight did each of those elements carry individually and what specifically did they have a bearing on? Public speaking is also just one arena. If a speaker’s voice could create a real impact there, where else could it be influencing us and how? I recall sitting in the audience at a conference, watching the closing keynote speaker. What she was speaking about, I can’t specifically remember however, I do remember noting at the time that she was credible, experienced and talking about a topic that was relevant and interesting to me. Yet, every 5-10 minutes, during this 45 minute talk, I found myself losing focus and trying to re-engage with what was being said, in order to try and gain something valuable and make my time there worthwhile. I wasn’t particularly tired. So why was it that she couldn’t maintain my attention? I realised that there was something about the way she was speaking that wasn’t quite working for me, but I couldn’t immediately pinpoint what it was. She wasn’t exactly monotone, I could hear her clearly, but I wasn’t feeling anything, neither excitement, nor intrigue. I knew however, that I was generally a person drawn to the voice because of my background and interest in radio. I did wonder though, what impact did her voice have on the other people in the room? I started noting down the different things that could contribute to a speaker’s presence on the stage. Do they need a slideshow to be engaging? If so, what should it look like? Could a good voice keep our attention? What is it that makes a voice sound good in the first place? The next day, I watched the closing keynote speaker with interest. She also spoke for 45 minutes and she didn’t have any materials to assist her. She stood in the same place the entire time, but I was hooked. This small experience essentially became the springboard for a detailed study to understand how important the voice is in helping individuals to make an impact, both on stage and elsewhere. The delegates at the conference were largely decision-makers in their respective companies and I realised they would be a perfect place to start with my questioning, but I didn’t have anything ready yet. Luckily, no one else knew that. I found the Programme Director at the end of the conference and talked to her passionately about this ‘study’ I was now conducting and, shortly after, I thankfully had the full delegate list and contact details in my hand. I compiled a draft of questions, sat down with a researcher to eliminate potential bias from them and then booked two days off work and started cold calling delegates from the list. Very early into this study, I discovered just how personal a thing voice is for people. The stories people recounted to me were fascinating and sometimes deeply sensitive. And once we started talking about it, people wanted to talk more. I started conducting the interviews in person and some of my participants spent hours talking with real enthusiasm for the topic. It was not at all what I had been expecting. I think my expectations were initially quite mechanical; I had expected to take people through a survey and gather some results. But, although my research was quantitative, the real gems of information were coming from the conversation afterwards. I had quite significantly underestimated the impact voice really had on people, including myself. By writing it off as a preference due to my radio background had clearly been an oversight. In total, I interviewed 143 senior executives. The outcomes are displayed on the infographic, so skip to that if you are interested purely in the numbers. What I am addressing here are the findings around it. The key finding I’d like to discuss here concerns the assumptions we make about people based on how they speak. As any researcher, I went into the study with an open mind, yet I had certain hunches about what I thought would be important to people. For example, I had always – perhaps subconsciously – assumed that pronunciation was something important to people, particularly in the context of business, and I also thought it was part of what people associated with the criteria of ‘being a professional’. Now, I couldn’t say with complete accuracy where the roots of this presumption were, but perhaps the clear-cut, shiny image of a corporate professional in the media had always appeared before me with clear English and correct pronunciation. It is a separate matter that this idea has not been given support by own experiences of the corporate world, where actually the CEO of the first company I worked for in London broke the stereotype and was hugely successful and engaging. 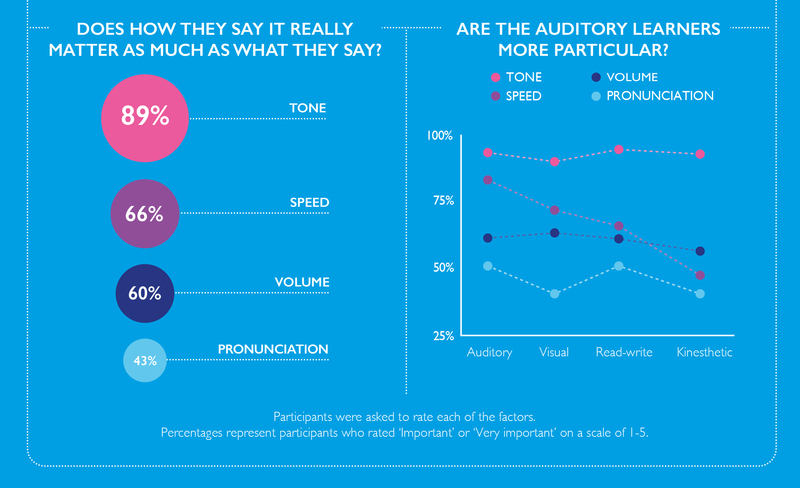 When the results were collated, it turned out that the importance attributed by the participants to tone was more than double the importance given to pronunciation. In fact, even though 43% of the participants held pronunciation as ‘Important’ or ‘Very important’ in determining their engagement with a speaker, pronunciation still sat at the bottom of the pile, with speed and volume being deemed significant by a higher number of the participants. Judging people based on our own actions is no surprise, really. I had come to a similar realisation of this from an experience in my personal life. During the second year of conducting the study, I went through an intense breakup and had one day sat crying to my mother, repeatedly saying “but I never would have done it like that” and “but if it were me, I would have…”. I hadn’t even realised what I was really implying or what I was using as the basis to judge him. She stopped me and explained to me very calmly and carefully that I could not judge him based on how I would have done things, because he was not me. And how doing that leads to expectations of the other person that are often unachievable. It was one of the most simple, but profound lessons that I learnt and the best thing my mother did in that situation was to bring my awareness to it. I still do it sometimes, but the difference is that I catch myself doing it now, and I can consciously make an effort to change direction when I do. Bringing this back to voice in the corporate world, it’s a similar thing. We often judge people in front based on how we might have said things and what that means about how they have said things. We can also quite easily come to a whole load of assumptions about the person based on how they said things differently and what that must mean about them. But what do we miss or lose in the process? Can it create misunderstanding? Can it create a lost opportunity if we don’t engage with the person as a result? It certainly has led to this outcome for me in the past. When a conference is over, I tend to go and speak to the people that engaged me because I liked them, regardless of whether or not their business proposition was relevant to me. Sometimes I assume their proposition isn’t relevant but the conversation afterwards shows me otherwise and a business opportunity is created. Or sometimes they can just connect me to someone that will be useful to me. But the point is, I never would have known if I hadn’t approached them based on how I perceived them to be, which I was often deriving from the way they spoke on stage. Equally, the people I didn’t approach afterwards could have had something great to offer me, but I would never find out, I would simply miss out. What does all of this mean for the speaker? Does it mean that we must rely on our audiences not to make incorrect assumptions and to approach us with an open mind? It would be nice to think that way, but there’s no guarantee that they will do that and it’s difficult to immediately programme a mindset for that kind of change. What I think is more useful to take away from this is that we could benefit from re-attributing weight to the parts of our voice and delivery that need attention. For example, if we had to place things in a hierarchy of importance, I would place factors like pronunciation and accent lower down in the order. I would even go so far as to term these things as the more superficial elements of our voice, which still have an impact, but are less important in the bigger picture. Higher up would be the things that make people feel and are sensitive or mindful of how the person in front will truly understand what you are trying to communicate. Speed is a great example of the latter. Slowing things down, or slowing things down in the right places, can really help someone to digest what you are saying and the parts of your message that are most important. In situations where we do need to communicate something really important, it might sometimes be met with nerves and anxiety, which creates a tendency for us to speed up what we are saying and get louder. When the opposite will actually have more impact, if we slow it down and turn it down a bit. Being mindful is a really key thing here and I learnt this lesson as a voice over artist. When I used to go for recording sessions at the BBC, they would last approximately two hours and I would be handed the script as we were walking towards the studio to record. The script would often contain a real mixture of things which required me to switch from excited, to authoritative, to conversational. And there were always different levels of ‘excited’ depending on many factors. So ‘excited’ for a music festival was high on the scale, and ‘excited’ for the breakfast show was lower on the scale. Why? Because I had to be mindful of the time of day. In the morning, people wanted to hear something cheerful, but they still needed easing into their day, so I’d tone it down a bit. I’d be mindful of my audience, rather than solely asserting what I wanted to do. In some ways everything is important or can be deemed important, but where you lose them, you can find them somewhere else. Your pronunciation might not be on point, but if you make them feel a certain way with the way you speak, you can win them back. The other way round is more difficult and I openly challenge anyone to argue and win the opposite. I will be a bit controversial and politically incorrect here in my example, but I still choose this because people can often relate to it. It’s a bit like the short guy that makes up for his height with a large personality. His ‘short height’ is the part that represents pronunciation – it’s largely superficial, it is only a problem to certain people and it has little bearing on the person’s ability to be credible or charming. The ‘large personality’ is the part that represents delivery of your voice – it can challenge the initial perception, it can subconsciously influence the way someone feels and ultimately it can create the connection needed between two people. As much as you want to build a connection with your audience and appeal to how they feel, it’s also important to ensure your message is something memorable. This is especially important in a world where we are so surrounded by information that we often get inspired by a talk one day and forget about it the next. I asked people what sort of style helped them to remember content more effectively, and they gave individual ratings to speakers being humorous, authoritative, radical and humble. One of my participants made a really valid point when she was rating humour, saying that “humour makes the presenter memorable but not necessarily the information”. I was glad that she made the distinction, because it’s a key one to make. I often read about research on the voice that leads to conclusions along the lines of CEOs with deeper voices being paid more or advising women to lower their pitch to get a promotion. I’m not a fan of these theories because I don’t believe limiting the voice to one particular sound is the answer. It may help achieve a certain perception, but there’s a lot more to be done than that. We are multifaceted people and we won’t always respond to one tone. In fact, we can respond to the same tone in multiple ways depending on the time, our mood, the weather outside and what we are doing in a particular moment. Taking this back to the question of which style is most effective in remembering content, people responded to all four. But to make the information memorable and not just the person, it is important to take inspiration from storytelling. Another of my participants commented “I like to be moved and taken on a journey”. When you tell a story, you are taking someone on a journey, and the whole journey could not be articulated effectively relying solely on a deep voice. You need to experiment with speed, volume, tone, language, pause and many other elements to really move someone. So humour might be your overriding strategy, but combining it with moments of authority or being radical can really help your audience to take in your message with greater effect. It’s a bit like telling scary stories around a campfire. You see people really experiment with all of these elements to create excitement, fear and intrigue in the people listening. Experimentation with your voice and your audience is often a lot more effective than constraining the voice to one dimension. Actor (reading) It was nine-thirty on Christmas Eve. As I crossed the long entrance hall of my house, on my way from the dining-room, where we had just enjoyed the first of the happy, festive meals, towards the drawing-room and the fire around which my family were now assembled, I paused, and then, as I often do in the course of an evening, went to the front door, opened it and stepped outside. Kipps (from the body of the theatre) This is intended to be of interest, I take it? Actor Why, yes, of course. Kipps Then why announce it as if it were the fatstock prices? Actor I’m afraid I don’t understand. Kipps Let us see this entrance hall, let us see this house, let us taste and smell this happy, festive meal! Kipps No, sir! Draw on your emotions, and on our imaginations. Actor Forgive me, I am not an actor. Kipps No. (Pause) Again. Try it again. Kipps You will excuse me. I know that what you read holds particular significance for you. That it is possible it will cause you some distress. But I must implore you: have sympathy for your audience.